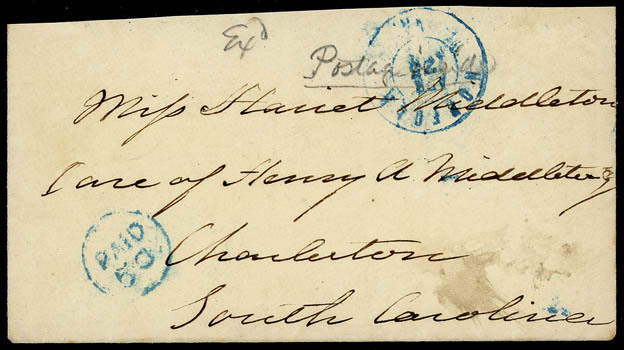 Confederacy, Norfolk Va., Apr 25, 1862, blue double-circle datestamp with matching "Paid, 5 C" circular rating handstamp (CSA type C) on civilian flag-of-truce cover to Miss Harriet Middleton at Charleston S.C., pencil "Exd" and "Postage Paid"; slightly reduced at top; probably enclosed in outer cover containing funds for postage and addressed to Fortress Monroe, typical of flag-of-truce mail it was exchanged at Norfolk, F.-V.F. ; signed Kimbrough. 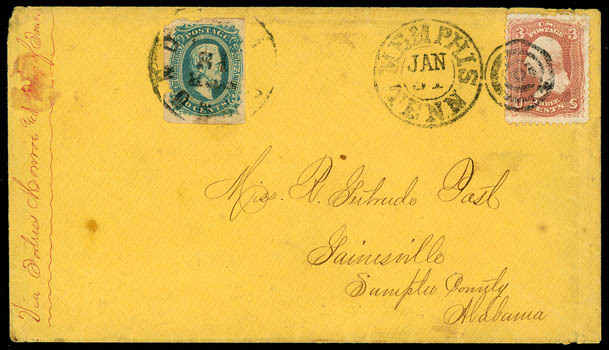 Confederacy, Civilian Flag of Truce, red manuscript endorsement "Via Fortress Monroe and Flag of Truce" on 1864 orange cover to Gainesville Ala., bearing U.S. 1861, 3¢ rose (small flaws), tied by "Memphis, Tenn., Jan 31" duplex, Confederate postage paid by 1863, 10¢ blue, large margins except piece out at left, tied by "Richmond, Va., Feb 18" cds; small stain spot, Very Fine, illustrated in Shenfield on page 37, ex-Everett, Boshwit. Scott No. 11+U.S. 65 Estimate $750 - 1,000.